MiniKingdom: The Boyz are back in town. Okay, after a busy evening and morning cleaning mould lines, building, and converting I have a decent chunk of regular troops ready. 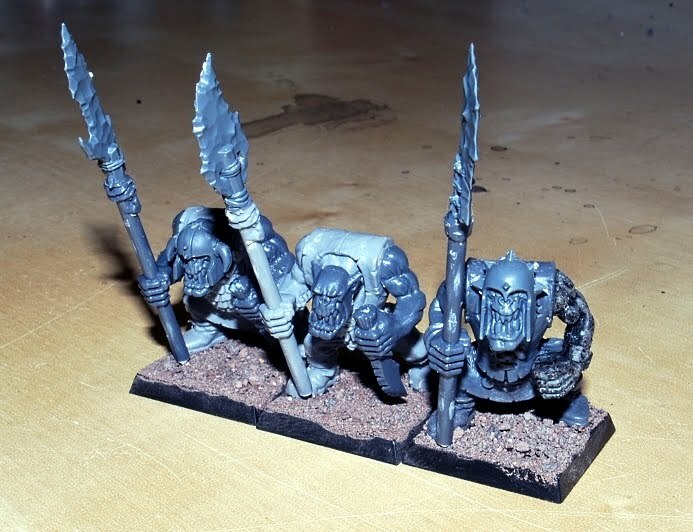 The Savage Orc Boyz were completed first, so as to see what weapons and arms I would have left over to mix in with the regular Boyz. The mould lines on the bodies were pretty extensive so this was slow going, but worth it I'm sure. 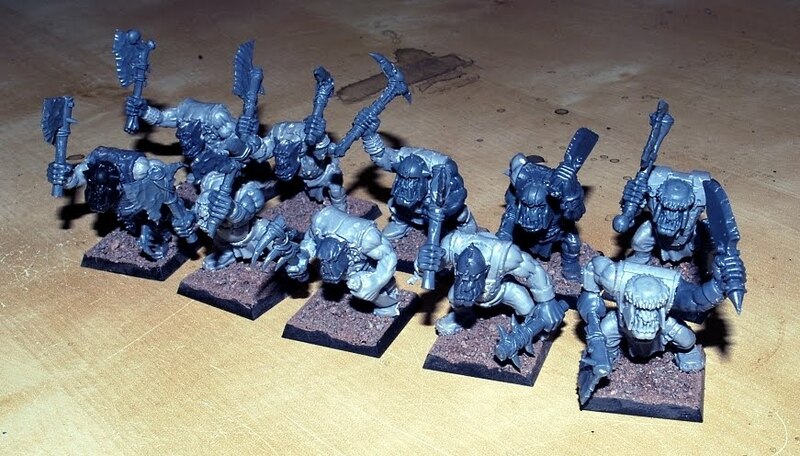 These are definitely fantastic and fearsome looking models. Though it is a kit with many components I did find the end result rather limiting due to the nature of the arm joints which only affix in a single pose (Note: if ever curious I have found the arms and heads with all the new kits are fully interchangeable: Savage Boyz, Boar & Savage Boar Boyz). So the end result will always be a much waving of weapons in the air, but they are Orcs and I suspect they just don't care. 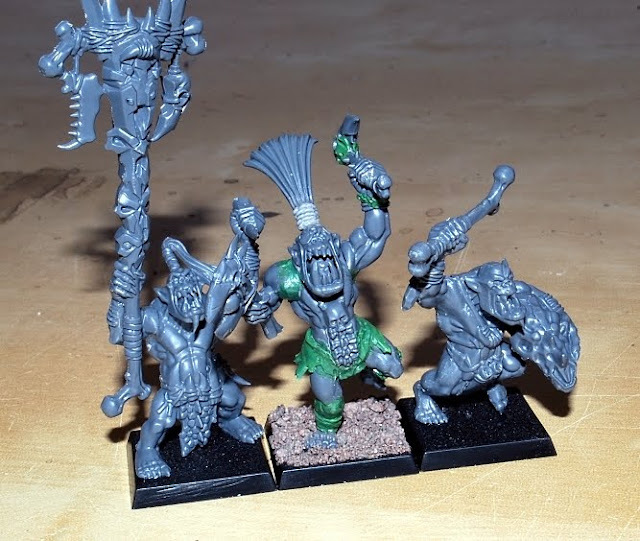 The converted Boss for the unit also seems to rank up happily up with his command compadres. The next job was patching together enough arms and weapons for the regular Boyz that have been built. 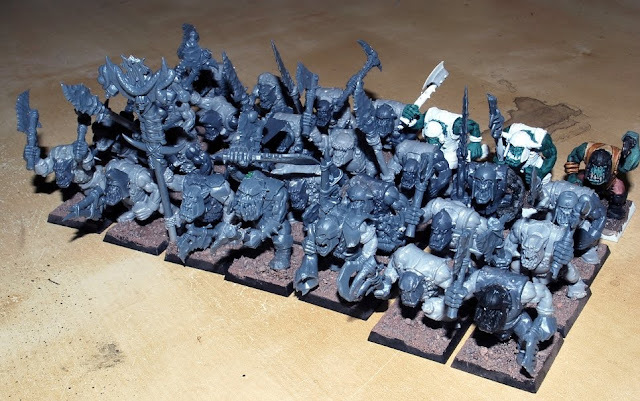 This mostly involves two hand weapons with many of the Savage Orc Boyz weapons mixed in. I do have a mix of weapon options on models in this unit so far for variety and the potential of changing up the wysiwyg front ranks. Mostly I like the aesthetic of ranked up spears and the design of the Savage Boyz spears (of which I now have plenty spare). Additional hand weapons first which do compose the majority of the unit (There are more than shown in this example). For the spears, I had originally attached the spears directly from the Savage Orc kit but this did not work ideally. The Savage Orc spear shaft is generally gripped too high for a normal spear pose. 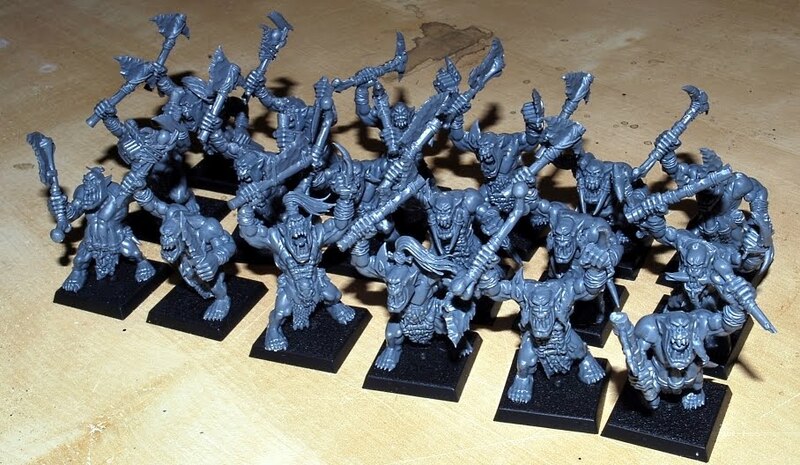 Instead I went about attaching only the Savage Orc spear heads to the regular Boyz spear arms. In modelling terms this does requires the two parts to have an accurately level contact point (Otherwise you'll have a wonky head), but with a careful eye, a sharp scalpel, and some testing this is easy enough. Spear Boyz not of the Wonky Head Tribe. I sure have lots of painting in my immediate future. Do ignore the white undercoat testers this was far from the effect I was hoping for. They will all meet the black can later today! WAAAGH! New Orc and Goblin army.